On invitation by Raj Sekhar Basu, the Indian Council of Cultural Relations (ICCR) Visiting Professor in Contemporary Indian Studies at Mykolo Romerio University (MRU) in Vilnius, Lithuania, SASNET deputy director Lars Ekund visited the Lituanian capital 23–25 March 2014. During his visit, he met researchers and administrators not only at MRU’s Asian Studies Centre, to which Prof. Basu is affiliated, but also researchers at the Center of Oriental Studies at Vilnius University, the other major university in the city. At both places, the SASNET willingness to extend links with South Asia related researchers in Lithuania, which is a neighbouring country of Sweden, was met with enthusiasm, and Lars was able to pick up much valuable information about recent initiatives regarding South Asian studies in the Baltic republics, that also include Estonia and Latvia. Ms. Giedre Raciene, ICCR Professor Raj Sekhar Basu, Dr. Audrone Januzyte, Mr. Lars Eklund, Prof. Inga Zaleniene, and Dr. Jusif Seiranov. Lars first visited the Asian Study Centre, one of the structural departments of Mykolas Romeris University established in year 2013. The purposes of the centre‘s activities are to promote the university‘s internationalisation development; and also mutual understanding and relation development between Asian countries, including India, and Europe by intellectural, cultural and human exchanges. The means include creating double degree program with Asian universities, and since two years back hosting the first and only ICCR Visiting Professor in Contemporary Indian Studies in Lithuania – Raj Sekhar Basu from the Department of History at Calcutta University in Kolkata. Communication and Mediation; Digital Technologies; and Psychology). 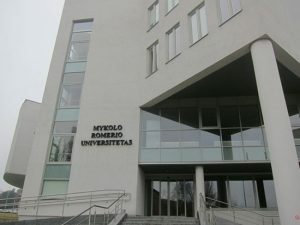 Mykolos Romerio University has hosted an ICCR professorship since 2012, and Prof. Zaleniene points out that this Chair in Contemporary Indian Studies has greatly enhanced the university’s prestige in the Baltic countries. It is administered through the Indian Embassy in Warsaw, that is also in charge of Lithuania (whereas the Indian Embasy in Stockholm handles Latvia, and the Indian Embassy in Helsinki handles Estonia). 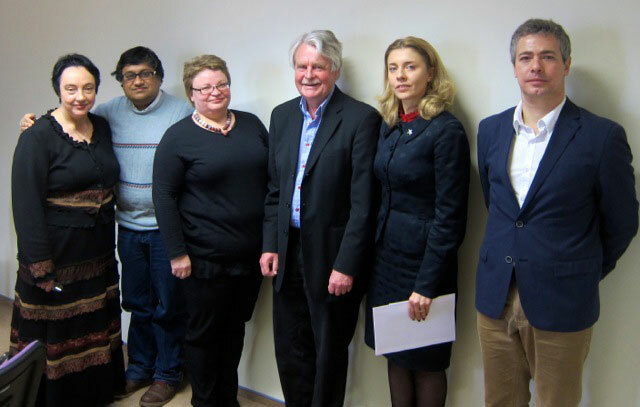 During his almost two-year sojourn in Vilnius, Prof. Basu successfully organised a major conference on ”Contemporary India: Challenges and Prospects” in 2013, a conference attended by Prof. Staffan Lindberg and Dr. Stig Toft Madsen, both former SASNET hands. See the conference report. 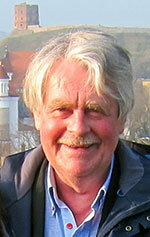 He has also visited Lund, where he held a well-attended SASNET lecture on Wednesday 27 February 2013. The theme for his lecture was ”Ambedkar and his Perceptions of Karl Marx and Buddha” (more information). Strangely enough, ICCR has quite unexpectedly decided that the Visiting Indian professorship will be moved over to Vilnius University from the Fall 2014. After the meeting: Associate Professor Audrone Januzyte, Professor Raj Sekhar Basu, and Associate Professor Jusif Seiranov. 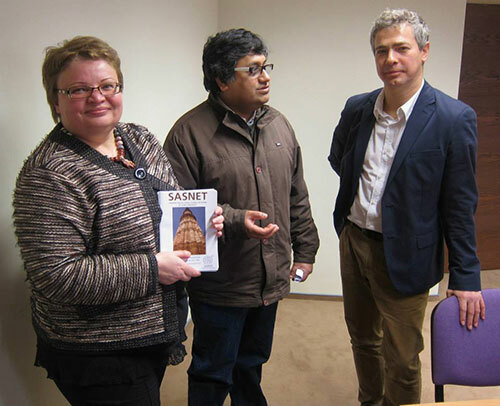 As can be seen, SASNET is well-known also in Lithuania. At the 24th March meeting, Dr. Audrone Januzyte also informed about her research and educational interests that are international politics and economics in Central and Southeast Asia, and Dr. Jusif Seiranov informed about his research interests that are Contemporary Indian Studies and Economic Systems in Asia. Right now, the university is keen to establish more links with Lund University and other Swedish universites, and Prof. Zaleniene requested Lars to extend an invitation to any researcher in Lund interested in studies on the Baltic countries to participate in a June 2014 conference in Vilnius on the issue of EU-Baltic relations. It will be hosted by MRU. Prof. Basu, who is specialised in the social history of the lower castes in the nineteenth and twentieth centuries, is also involved in planning to organise a workshop with Professor Sukhadeo Thorat, presently the Chairperson of the Indian Council of Social Science Research in New Delhi. Prof. Thorat is a well known economist, former Chairman of the University Grants Commission, and was the founder of the Indian Institute of Dalit Studies, New Delhi. This would enhance the possibilities of research collaboration between the Baltic States and India, which could also have a space for participation of Scandinavian researchers, since they according to Prof. Basu have been the pioneers of studies on Contemporary South Asia. After the meeting, Prof. Basu and Dr. Seiranov organised a tour for Lars to Trakai, the ancient capital of Lithuania, by university transport. Trakai is the national symbol of the young Lithuanian state, and it became an interesting visit to a most tranquil place with charming old buildings, a renovated island palace and a restaurant serving traditional oriental dishes prepared according to old recipes saved in Karaim families. Karaims (also known as Qarays) is a small community of Turkish origin, that once served as soldiers in service of the Lithuanian kings, defending the Trakai castle, only few of their decendants still living in the country. 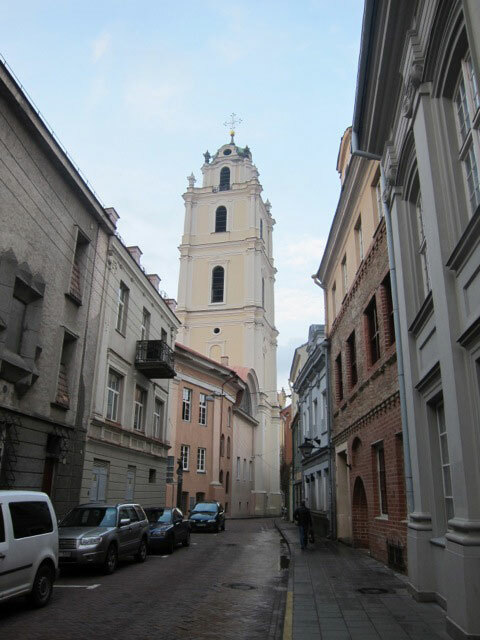 In the afternoon, a visit was arranged to the Center of Oriental Studies at Vilnius University, the older and larger university, located right in the centre of the old town surrounded by churches and monuments, and also the presidential palace. A meeting had been scheduled by Prof. Raj Sekhar Basu for Lars to meet the researchers involved in Indian Studies at the Center, especially the Director of the Center of Oriental Studies, Audrius Beinorius, who is Professor of Indian and Buddhist Studies, and a specialist on Sanskrit, Pali and Indian Philosophy. 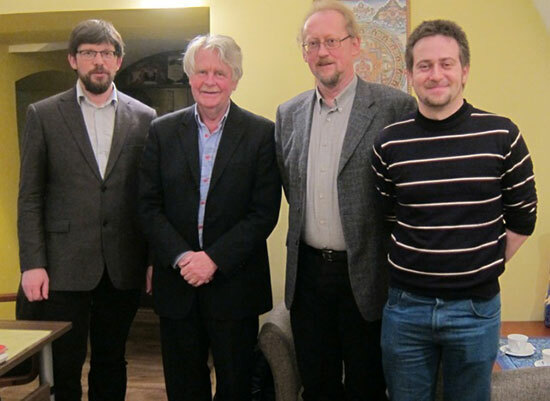 Vilnius University, Center of Oriental Studies: Valdas Jaskunas, Deputy Director of Studies, and Associate Professor of Indian Studies; Lars Eklund, SASNET; Audrius Beinorius, Director, and Professor of Indian and Buddhist Studies; Dr. Deimantas Valanciunas. Also present was Associate Professor Valdas Jaskunas, Deputy Director of Studies at the Centre. Dr. Jaskunas was a contact person for Vilnius University in the 2008 and 2009 Indo-European Erasmus Mundus Action 2 mobility programmes that were coordinated by Lund University. He visited Lund for consortium meetings at that period and had contact with the consortium director, Dr. Sidsel Hansson. Prof Beinorius and Dr. Jaskunas were very happy with the outcome of these Erasmus Mundus programmes, making it possible for several Lithuanian students and researchers to visit India on scholarships, and attracting Indian students to Vilnius. They were disappointed to learn that Vilnius University is not a member of the new Indo-European Erasmus Mundus programme coordinated by Lund University starting from 2014 (more information about the EMINTE programme and other current South Asia related Erasmus Mundus programmes). They were both eager that collaboration should be re-established with Lund University if possible, and also with other Swedish universities since Sweden is one of their closest neighbouring country. A third researcher, Dr. Deimantas Valanciunas, also took part in the afternoon meeting. He is doing post-doc research on Indian pop culture and film. His PhD thesis was entitled ”Construction of Identity in Indian and British Film: A Postcolonial Approach”. He will participate in the 23rd European Conference on South Asian Studies that will be held in Zurich, Switzerland, 23–26 July 2014. A conference that also Lars Eklund will attend as SASNET representative. Dr. Valanciunas and his collegues were now busy preparing for a conference connecting Asia related researchers in all the Baltic countries, the Baltic Alliance for Asian Studies (BAAS) Vilnius Conference 2014, to be held on 3–4 April. The BAAS 2014 biannual conference is aimed at creating a forum of the researchers in Asian, Middle Eastern and African studies from the three Baltic states and their international partners. Full information about the conference. BAAS currently has had five members (alphabetically after the University): Department of Middle Eastern and Asian Studies (Tallinn University, Estonia), Centre for Oriental Studies (Tartu University, Estonia), Department for Asian Studies (University of Latvia in Riga), Centre of Oriental Studies (Vilnius University, Lithuania), and Centre of Asian Studies (Vytautas Magnus University, Lithauania). More information about the Baltic Alliance for Asian Studies. The Centre for Oriental Studies is also involved in another scholarly network, that is the Central & Eastern European Network of Indian Studies (CEENIS). This network has organised two major Indological conferences, one at Warsaw University in Poland in September 2005, and another one, focusing on ”New Perspectives on Education about India, at Vilnius University in August 2006. The CEENIS has also an ambition to work for the mobility of teaching staff and students in the region, as well as for the optimal compatibility of didactic programmes of its members. The coordinator is Prof. Danuta Stasik at the Institute of Oriental Studies, University of Warsaw. More information about CEENIS. The Centre of Oriental Studies is the major institution of Asian studies in Lithuania as well as an academic core unit of Vilnius University. It has functioned since 1993, its foundation date, however, goes back to the early 19th century, when Vilnius University was the heart of the studies of Oriental languages in Lithuania. The Centre focuses its studies on the regions of Asia and Near East on BA and MA levels, and serves a link among the Lithuanian researchers of the East. The objective of the Centre is to prepare specialists in the field of Asian studies needed for scientific research, the development of cultural and business relations as well as to promote better understanding of the Eastern cultures in Lithuania, and to foster the collaboration between the East and the West. No PhD studies take place at the centre, instead PhD candidates are registered with one or another of the departments at the university. In the Soviet times and under the control of Moscow’s authorities Lithuanian schools of higher education were not able to set up academic institutions of Oriental studies. Their only way out was to send students to study at Russian Universities. It was not until after Lithuania regained its independence in 1990 that the new wave of interest in Oriental studies spread over the country. Since the academic year 2000 a Bachelor of Arts Programme of Comparative Asian Studies has been going on. Since then the Programme has given rise to specialists in Arabic/Islamic, Chinese, Japanese, and Indian studies. From 2006 a new postgraduate ”Contemporary Asian Studies” MA programme is implemented at the Centre, and in 2002, the Oriental Centre set up the Eastern Languages School which since then has invited everybody willing to study Japanese, Chinese, Arabic, Farsi, Hindi, Sanskrit, Turkish, and Korean languages. Read more about the Center of Oriental Studies at Vilnius University.